GeneMarker® HID human identity software accepts all ABI®PRISM-310-3100-3730-3500 HID file types and contains a linked, searchable Relationship Database; providing rapid location of exact matches between the genetic STR profile from any PCR chemistry (including Identifiler®, PowerPlex®16, PowerPlex®ESX/ESI) of a reference sample from a missing person or mass disaster victim. If a reference sample is not available, the program uses identity by descent calculations to locate potential relatives and provides likelihood ratio of most probable relative(s), with a setting to tolerate mutation using AABB mutation rates. The program uses allele frequencies from major US populations, or analysts can easily import population specific tables. The same approach is used to locate exact matches between a suspect and crime scene DNA, or familial searches when there are no exact matches between the crime scene DNA and the database. 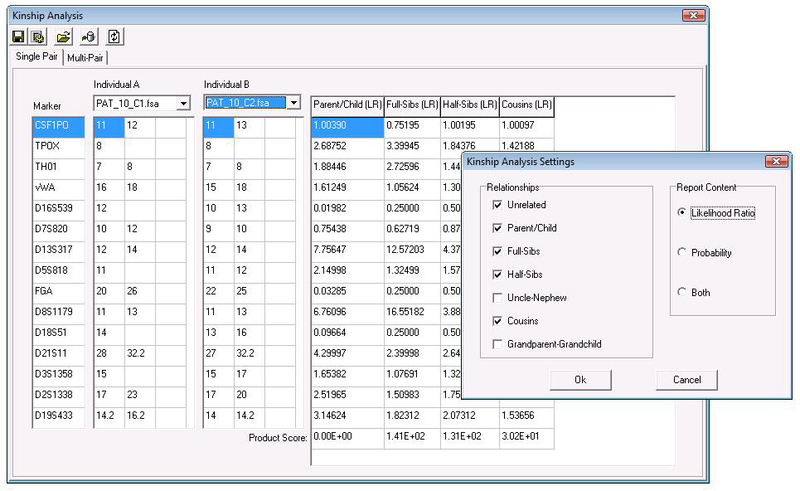 The Kinship Analysis application provides likelihood ratios and probabilities for each locus, with report format flexibility; including Parent, Sibling, Half-Sibling, Grandparents, Aunt/Uncle, Cousins. The Database Search screens the entire database and displays any exact matches, near matches and potential relatives along with the likelihood ratio results. Robust statistical analysis calculates combined Likelihood Ratios (using identity by descent, Brenner 1997). The result table may by copy/pasted into an existing document or saved as a .txt file. Kinship Analysis options provide flexibility to analyze data for casework and legal presentation. 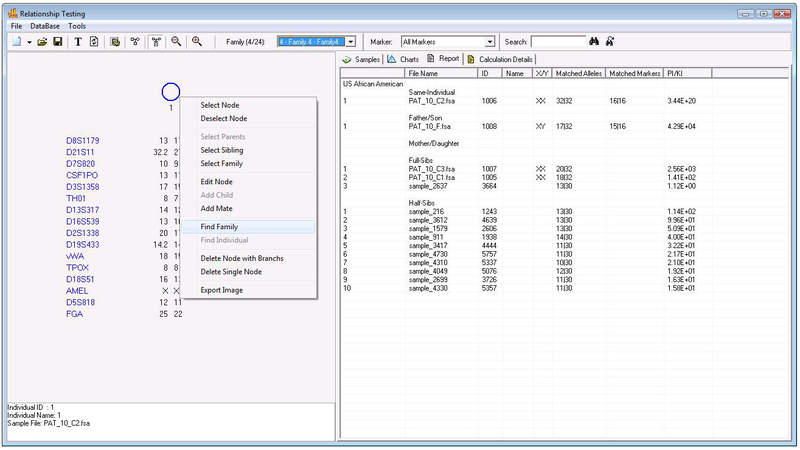 Options include Relationship levels, Likelihood Ratios and/or probabilities for each locus and combined values.